Is ISIS’ Comment on the Manhattan Attack Out of the Ordinary? Not Really. 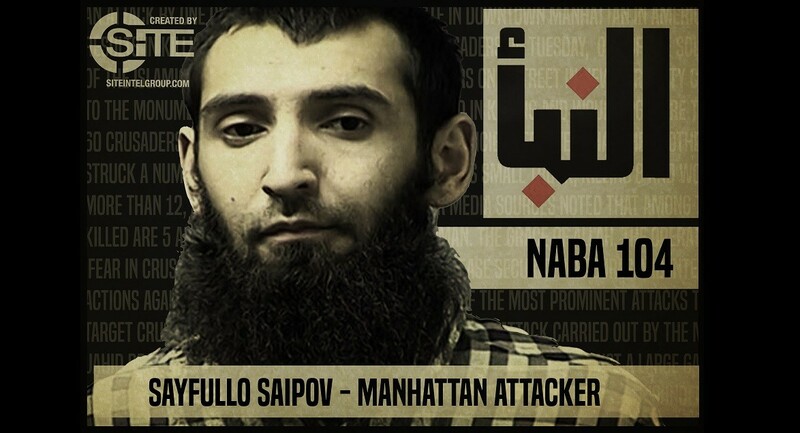 The Islamic State (IS/ISIS) has desired to attack New York City for years, and there is no doubt that ISIS-pledged Manhattan attacker Sayfullo Habibullaevic Saipov committed his devastating attack in response to the group’s incitements. But contrary to reporting by some prominent news outlets, the group didn’t actually take responsibility for Saipov’s attack, and its message regarding the attack was not atypical. ISIS' report about the Manhattan attack, actually, was well in line with those of other ISIS-inspired attacks. The following article analyzes ISIS’ response to Saipov and his attack by the following variables: ISIS’ language and statement formatting for coordinated attacks vs. inspired attacks; timings in which ISIS releases statements on attacks; the outlets through which ISIS issues statements on attacks; and the group’s history of claiming or endorsing attackers while they are still alive. 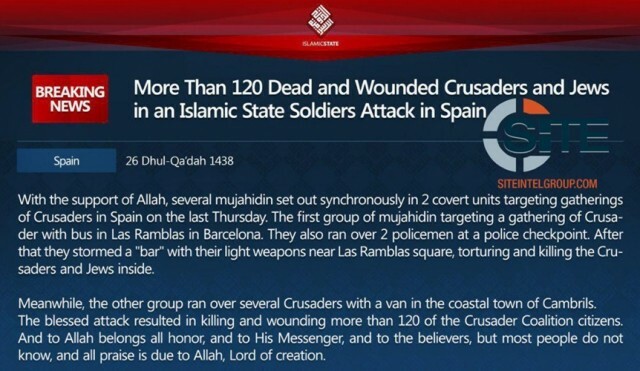 On Tuesday, 11 Safar, one of the soldiers of the Islamic State attacked a number of crusaders on a street in New York City, close to the monument for the 9/11 raid, which resulted in killing and wounding more than 60 crusaders, and unto Allah is all praise. Media agencies reported that the brother struck a number of crusaders in Manhattan with his small truck, killing 8 and wounding more than 12, and unto Allah is all praise. So if ISIS called Saipov one of its “soldiers,” the group is logically claiming responsibility for the attack, right? ISIS statements for attacks are loaded with subtle elements which indicate its varying degrees of responsibility—whether it be full coordination or having merely inspired a given attack. “Soldier of the Caliphate” is a title ISIS gives to attackers around the world, regardless of whether or not they had coordinated their attacks with the organization. Its logic is that any person who pledged to ISIS and carried an attack in response to its incitements is a “soldier of the Caliphate.” But to that point, naming Saipov as a “soldier of the Caliphate” doesn't indicate that ISIS actually claimed “responsibility,” as some outlets have reported. Note that all of the above statements are issued by ISIS’ ‘Amaq News Agency, not through ISIS’ central media command. This method of issuing statements is in itself another way to distance the group from an attack in which it wasn’t directly involved. However, in addition to the ‘Amaq message, ISIS also issues official communiques from its central media command when it wants to indicate the attack as being coordinated. Note the official communique issued for the London Metro attack, issued shortly after the aforementioned ‘Amaq message. A security source told al-Naba that Charles de Gaulle Airport in the French capital, Paris, was evacuated on Sunday, 26 Dhul-Hijjah [17 September], due to explosive devices planted by a security detachment belonging to the soldiers of the Islamic State. The security source added that the security detachment was able - by the grace of Allah - to enter the explosive devices into the inside of the airport, and plant them inside pre-determined locations. However, the Crusader forces managed to detect their presence before their detonation, and immediately evacuated the airport. The word detachment is not unique to ISIS claims for attacks in the West. ISIS also uses the word detachment to describe claims of attack in Iraq, Syria, and across the world. Much buzz has surrounded the timing of ISIS’ statement for the Manhattan attack, which it issued two days after the event. Such a delay is not so unusual for ISIS, though. The following chart shows various ISIS-claimed/commented-on attacks (both as inspired and coordinated) throughout the West, and how long it took for ISIS to issue a statement on them. 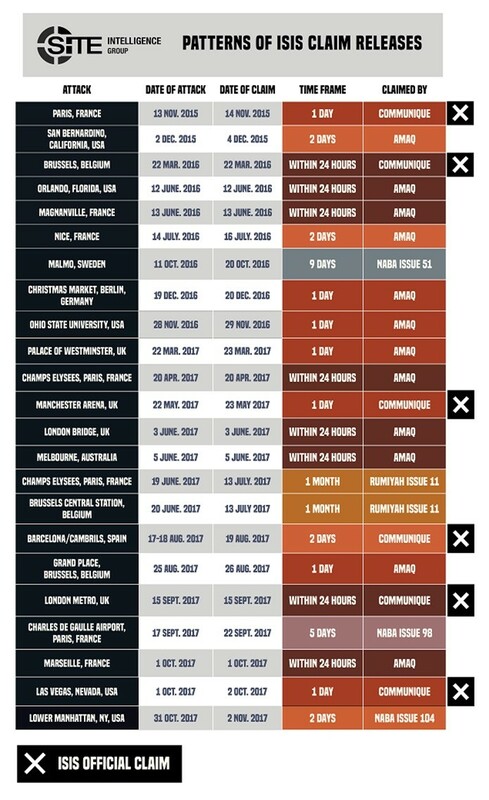 As the chart shows, multiple attacks, including the July 2016 Nice vehicular attack and the aforementioned Barcelona operation in August, were claimed two days after being committed. Others, like the June 2017 Champs Elysees and June 2017 Brussels attacks, were issued a full month later. The method in which ISIS’ statement for the Manhattan attack was released, Naba newspaper, also reflects nothing abnormal for the group. ISIS has multiple ways it will claim or issue a response to an attack. Typically, ISIS claims its coordinated attacks with red and blue communiques issued by its Nashir Telegram channel. These communiques may be preceded by an ‘Amaq statement. However, ISIS has used Naba to respond to attacks on numerous occasions, among which being last month’s incident at Charles de Gaulle Airport in France; a fire in Malmo, Sweden; and a fire at a furniture factory in Russia. ISIS also claims or issues statements on attacks by other means, namely its al-Bayan Radio news bulletin and Rumiyah magazine. Attacks in the West reported on in Rumiyah have included the June 2017 Champs Elysees attack and the June 2017 Brussels Central Station attack, both of which were commented on in issue 11 of the magazine. Does ISIS only Respond to Attacks by those who were Killed? In most cases, ISIS attackers are not alive when ISIS claims their operations. However, it is not unheard of. For Anis Amri, who also performed a vehicular attack at a Berlin Christmas Market last year, ISIS responded to the attack via its ‘Amaq News Agency on December 20, days before he was killed in a shootout in Milan. ISIS similarly claimed the London Metro bombing this past September, though the attackers were still alive and would be arrested in the coming days. This claim was notably issued less than 12 hours after news of the incident broke, at which point much information—including a motive—were still unconfirmed. ISIS reported on the Manhattan attack only through its ‘Naba magazine, using language akin to that of ISIS-inspired attacks. The statement furthermore offered no additional information about Saipov or his attack, as the group commonly does for coordinated attacks. Considering these elements, Saipov’s attack appears to be the standard case of someone radicalized—at least in a significant part—online, proving once more how dangerous ISIS propaganda is. Sure, ISIS calling Saipov one of its "soldiers" is a way of claiming responsibility for the attack, but only if we are to consider what is effectively an endorsement by ISIS as a claim of responsibility (i.e., if an attacker is inspired by ISIS, then that attack was in some way ISIS' doing). However, reports should specify these conditions, because such concerns amount to more than petty semantics. The exact manner in which ISIS responds to an attack—the timing, outlet from which the statement was released, the carefully made wording—is critical to understanding it and hence, developing a better public understanding and effective strategy for prevention. Thus, these variables deserve the same scrupulousness and sensitivity to nuance that we’d give to any other matter of national security. Has al-Qaeda Replanted its Flag in Syria? Rita Katz is the Executive Director and founder of the SITE Intelligence Group, the world’s leading non-governmental counterterrorism organization specializing in tracking and analyzing online activity of the global extremist community. Ms. Katz has tracked and analyzed global terrorist and jihadi networks for over two decades, and is well-recognized as one of the most knowledgeable and reliable experts in the field. Ms. Katz has infiltrated terrorist fronts undercover, testified before Congress and in terrorism trials, and briefed officials at the White House and the Departments of Justice, Treasury, and Homeland Security. Her investigations and testimony have driven action by several governments against terror-linked organizations and individuals. She has provided counterterrorism training sessions to military leadership, intelligence analysts and law enforcement agents from numerous government agencies in the U.S. and abroad. She has led numerous workshops for non-governmental organizations and academic audiences. For her unique contributions to FBI counterterrorism investigations, Ms. Katz received special recognition from FBI Director Robert Mueller for her "outstanding assistance to the FBI in connection with its investigative efforts." Outlets to profile Ms. Katz have included the New Yorker, the New York Times, and 60 Minutes. Her commentary on the recruitment, financing, and operations of terrorist organizations regularly appears in leading media outlets such as The New York Times. Reuters, CNN, and The Huffington Post. She is also a regular contributor to The Washington Post, VICE News, The International Business Time, and other publications. Ms. Katz is the author of Terrorist Hunter: The Extraordinary Story of a Woman who Went Undercover to Infiltrate the Radical Islamic Groups Operating in America (Harper Collins, 2003). Born in Iraq and a graduate of Middle Eastern Studies at Tel Aviv University, Ms. Katz is fluent in Arabic.